CrcCheckCopy is a command line utility that lets you compare the files of different folders. It generates a CRC32 for each file and stores it in one checksum file. This small file can then be used to either check/compare another folder hierarchy or be used as an integrity check of the same folder hierarchy. The files are compared in binary mode. The checksum file enables you to compare folders on two remote computers without needing to transfer the whole folder structure over the internet. Other file/folder comparing utilities need concurrent access to both folder hierarchies and need to read all the files (in most cases they contain some gigabytes spread in multiple files). CrcCheckCopy is a console application (command line tool) that runs on Windows and Apple MacOS. You can use the comments section below for any other feature requests and suggestions related to disk/folder/file comparison tasks. IT administrators, who must do reliable file copies of large volumes of data. IT administrators can use CrcCheckCopy to ensure (with a proof) reliable data copies to their managed servers in their data centers. CrcCheckCopy was originally created for professionals in the multimedia sector. These included DVD/CD manufacturing factories, DVD/CD software authors, DVD/CD preprocessing, mastering studios. 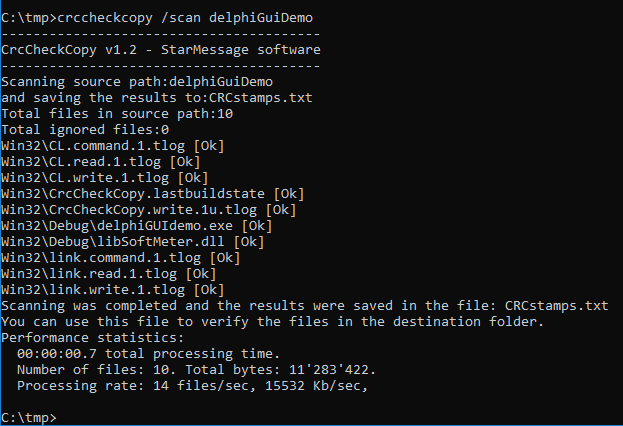 CrcCheckCopy allows you to take a checksum file containing the CRC of each file on an incoming disk and when the processing of any files is completed, to verify the produced final disk. The utility can show which files have (expected) differences. This is something that cannot be done if you create a single CRC for the whole disk. Power users who want to ensure the reliability of their data copies. Some files do not get copied because of the limitation of the maximum directory length. The message shown by Windows will not explain to you which files were affected. USB flash disks worn-out while being used. Some of their files might become "corrupted" (this is not a moral term but a computer term meaning that the files were altered by defects of the medium). Copying to different files systems might alter the filename characters, e.g. Chinese or eastern European characters get converted to something that is compatible with the destination file system. These files might then become unreadable by other computers. You will most probably not see a warning about this during your file copy operation. It is a silent error. Accidental user mistakes, e.g. you accidentally drag and drop some files in a different folder (the accidental file move operation can every easily go unnoticed). 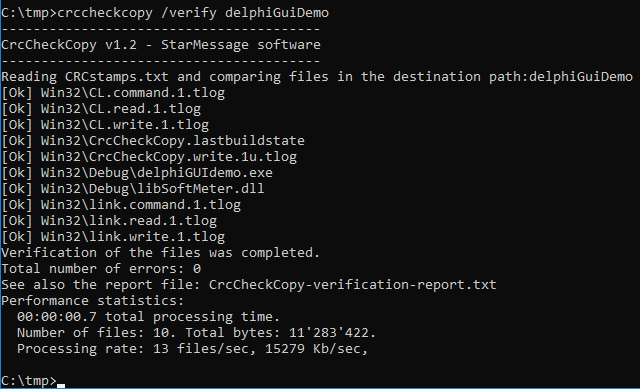 CrcCheckCopy can generate signatures (CRC32 checksums) of all the source files, and compare them with the destination copy, alerting you for any differences found. You can even store the CheckCopy utility and the checksum file to the destination disk or folder so that the recipient of the copy can verify them at any time. People who want to archive data files and be sure that nothing has altered them, like in the case of long-time preservation. Storing the checksum stamps file (and the CrcCheckCopy utility itself) together with the archived files will give you the ability to verify the integrity of your data at any time in the future. Just run the utility in verification mode, using the existing checksum stamps file. How are you using our file comparison and crc verification utility? Use the comments below to send us your use cases. You can help us fine-tune the software and/or add new uses for it. The current version is completely free. The utility will read all files and store their CRCs in a file named "CRCstamps.txt", in the current directory. You can open this file to observe its contents. The utility will open the file "CRCstamps.txt" from the current directory, and verify that the files inside "c:\my-destination-folder" have the same CRCs. A new text file "CrcCheckCopy-verification-report.txt" will be created in the current directory, listing any errors found. CrcCheckCopy - Folder comparison using CRC32 checksums. Verify by CRC that your file/folder copies are identical. Compare multiple destination disks in half the time. If you are doing mupliple copies, CrcCheckCopy can verify them in half the time. The scaning of the source disk is done only once, while the verification can be done as many times you want, using the same checksum file. No need to read again the source files. The verification will skip the CRC checksum calculation if the sizes are different. This will speed up the verification process and reduce disk activity. No network traffic if the files reside on different servers. Can work also without network connectivity. Compare folder hierarchies or whole disks in remote locations (not on the same local network). You only need to send the checksum file from the computer holding the source files, to the computer where the destination files or disks are. E.g. a software manufacturer can send the checksum file to the DVD factory to verify that the final DVDs are verbatim copies of the original, while having the option to accept differences in some "last minute" files. Store the checksum file as produced by CrcCheckCopy on every important data copy or backup you do. This will allow you (or others) to check the integrity of the files at any time in the future. Alternative to md5 compare function of rsync. Portable executable: no installation is needed. No administrator account needed (because there is no installation). Small size (Less than 0.5 Mb). Can be transfered easily and quickly via remote desktop connections. See the version history on GitHub. Alerts for new version releases. "Watch" or "Fork" our GitHub page to receive notifications for every new release. Excellent and small software. It was perfect and bug-less for HUGE data of our engineering company. Thanks to programmer to his support and to release this new version. After copying an old partition to a new purchased hard drive, to ensure that all data are identical and to have a report for all files, I used this software. I ran it on a 400 GB folder with about 300,000 files and many many sub-folders, some file-names was in unicode. It runs in less than 3 hours on the above system to generate a CRC-32 report for this huge data. Very good, thank you so much! "Error: 2nd argument must be the path of the folder to check. Run the program without parameters to see its help." This small detail confused me a moment ago.